AAEA Hollywood: "The Beat! Go Go Music From Washington, DC"
The Beat! Go Go Music From Washington, DC is a reissue of an earlier book on go-go that Charles Stephenson co-authored with Kip Lornell. This updated edition includes a new epilogue addressing developments in go-go since the last publication. Stephenson and Lornell invite you to An Evening of Go Go Facts, Fun, & Music at the Busboys and Poets, 2021 14th Street, NW, on Wednesday, September 30, 2009, from 6 PM - 8 PM. 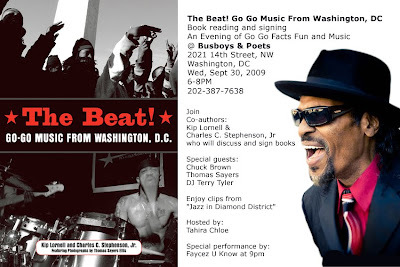 Please join them and special guest Chuck Brown for a special reading and signing of The Beat!